Villaggio Reserve sees a growing trend among their customers. Those interested in 55+ communities are now expecting high-end amenities. Villaggio Reserve has recently discovered that buyers interested in today’s 55+ communities want the most modern amenities available. What were upgrades yesterday are now expected to come standard in the newest homes. Villaggio Reserve has adapted their newest 55+ resort-style community in Delray Beach to satisfy their buyers. From architectural features to high-end appliances, cabinetry and safety measures, Villaggio Reserve’s single-family residences and villas enjoy quality features – from the outside in. Spanish-Italian designed exteriors, decorative stone driveways and walkways and lush landscaping enliven the exterior. Impact-resistant windows and doors deliver peace of mind and safety. 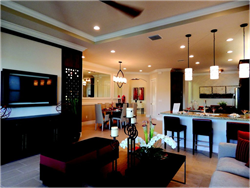 Inside, coffered ceilings and recessed lighting add elegance and style. Villaggio Reserve uses upgraded and plush wall-to-wall carpeting and padding and 18-by-18 ceramic tiles in most foyers, living rooms, dining rooms, family rooms, kitchens, eat-in kitchens and laundry areas. High-quality Sherwin Williams interior paint brightens spacious rooms, where layouts and lines are designed for entertaining. Buyers have their choice of marble windowsills, 5 1/2-inch decorative baseboards and colonial-style 8-foot raised panel doors with Schlage® lever door handles in a stain nickel finish. Rocker-style electric switches also come standard. Buyers can choose the color of their attractive and durable granite counter tops, and Kitchen Craft Cabinetry® is standard in kitchens and baths. Sustainability is important at Villaggio Reserve, with energy efficient, stainless steel GE® appliances and 50-gallon quick recovery hot water heaters. Sixteen SEER rated high-efficiency Carrier air conditioning units are controlled by programmable thermostats and blow through vents in every room, including bathrooms and walk-in closets. A wide selection of upgrades is available to customize and personalize each Villaggio Reserve villa or single-family home interior. With so many high-end features and amenities all standard, Villaggio Reserve has taken South Florida living to the next level. In fact, upgraded living is always standard at Villaggio Reserve. Excitement is delivered daily at the Cabana Club Clubhouse, the 38,000-square-foot town square and lifestyle destination. Enjoy breakfast, lunch and dinner indoors or out. Events are staged in the Grand Ballroom, and games and crafts are a common sight in the multipurpose rooms. Residents can also work out in the fully-equipped and -staffed Fitness Center, hit the lighted tennis courts or take a dip in one of four pools. Visit Villaggio Reserve on Hagen-Ranch Road and Atlantic Avenue or online at http://villaggioreserve.com/, or call today at (855) 230-1817. The Sales Center is open from 9:30 a.m. to 5:30 p.m. Monday through Sunday.